The SampleRateConverter System object™ converts the sample rate of an incoming signal. Create the dsp.SampleRateConverter object and set its properties. src = dsp.SampleRateConverter creates a multistage FIR sample rate converter System object, src, that converts the sample rate of each channel of an input signal. src = dsp.SampleRateConverter(Name,Value) returns a multistage FIR sample rate converter System object, src, with properties and options specified by one or more Name,Value pair arguments. Specify the two-sided bandwidth of interest (after rate conversion) as a positive scalar expressed in Hz. This property sets the two-sided bandwidth of the information-carrying portion of the signal that you wish to retain. Specify the sample rate of the input signal as a positive scalar expressed in Hz. The input sample rate must be greater than the bandwidth of interest. Specify the maximum allowed tolerance for the sample rate of the output signal as a positive scalar between 0 and 1. The output rate tolerance allows for a simpler design in many cases. The actual output sample rate varies but is within the specified range. For example, if OutputRateTolerance is specified as 0.01, then the actual output sample rate is in the range given by OutputSampleRate ± 1%. 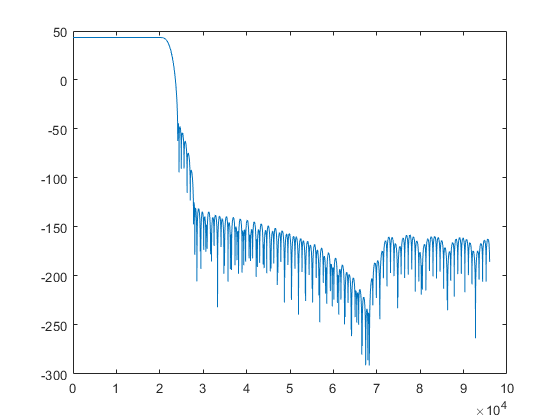 Specify the sample rate of the output signal as a positive scalar expressed in Hz. The output sample rate must be greater than the bandwidth of interest. Specify the stopband attenuation as a positive scalar expressed in dB. This property is the minimum amount by which any aliasing involved in the process is attenuated. 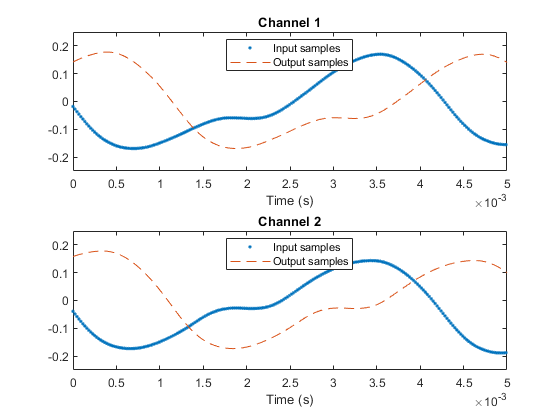 y = src(x) designs one or more multirate FIR filters and then uses the filters to convert the rate of each channel (column) of the real or complex input signal x to the output sampling rate. Input signal, specified as a vector or a matrix. The row length of x must be a multiple of the overall decimation factor. The decimation factor is determined from the getRateChangeFactors function. Each column of x is treated as a separate channel. Convert the sample rate of an audio signal from 44.1 kHz (CD quality) to 96 kHz (DVD quality). Run the system for 15 s. Release all objects. Plot the input and output signals. Use a different set of axes for each signal. Shift the output to compensate for the delay introduced by the filter. Zoom in to see the difference in sample rates. Use a different set of axes for each channel. Create a multistage sample rate converter with default properties. The converter converts from 192 kHz to 44.1 kHz in three stages. 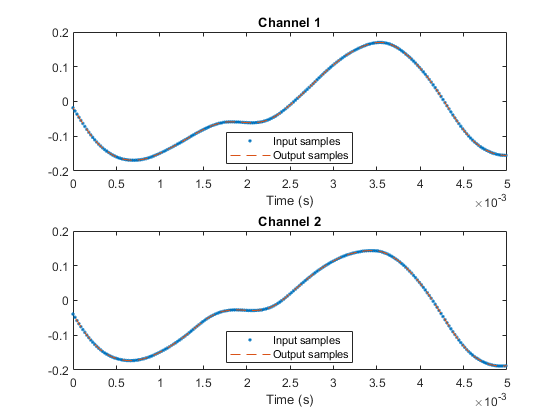 Use src to convert the sample rate of a noisy sinusoid. The sinusoid has a frequency of 20 kHz and is sampled for 0.1 s.
Estimate the power spectral density of the input. Convert the sample rate of the signal. Estimate the power spectral density of the output. 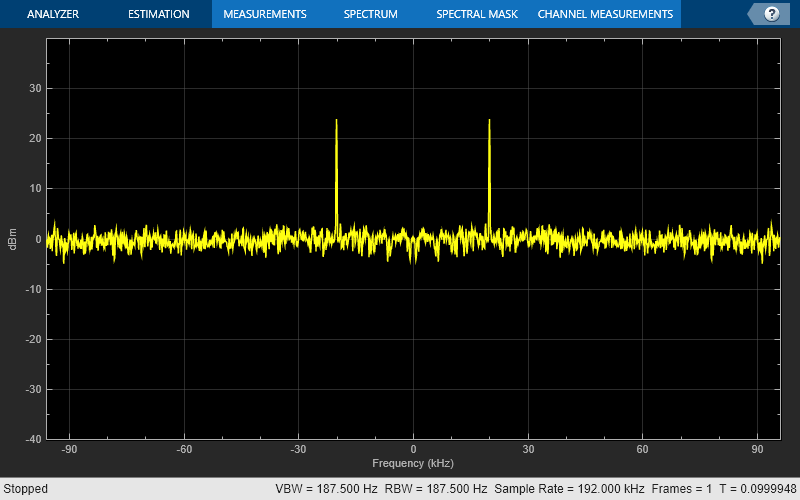 A signal output from an A/D converter is sampled at 98.304 MHz. The signal has a bandwidth of 20 MHz. Reduce the sample rate of the signal to 22 MHz, which is the bandwidth of 802.11 channels. Make the conversion exactly and then redo it with an output rate tolerance of 1%. Use the cost method to determine the cost of each sample rate conversion. The zero-tolerance process requires more than 500 times as many coefficients as the 1% process. Find the integer upsampling and downsampling factors used in each conversion. 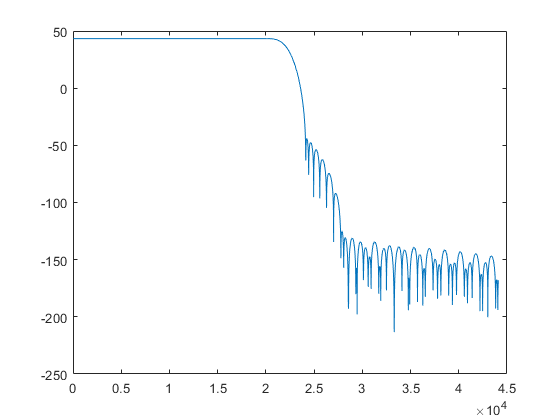 Compute the actual sample rate of the output signal when the sample rate conversion has a tolerance of 1%. Create a multistage sample rate converter with default properties, corresponding to the combined three filter stages used to convert from 192 kHz to 44.1 kHz. Determine its overall decimation and interpolation factors. 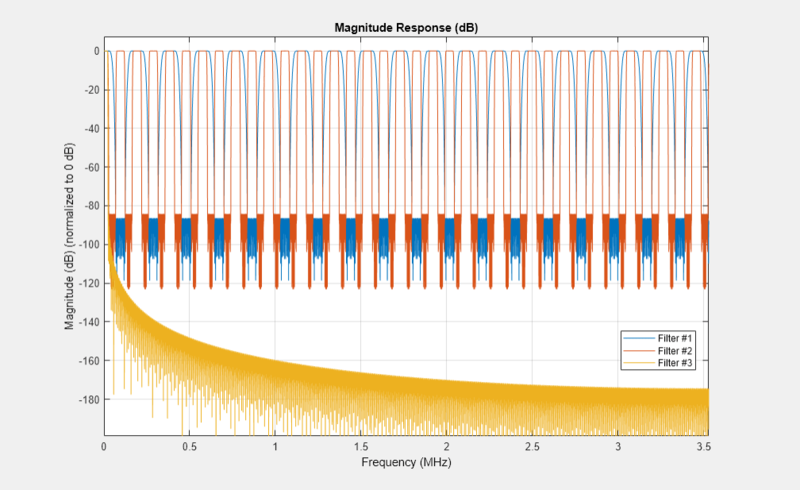 Create a two-channel random signal. Specify a number of samples equal to the decimation factor. Call the object twice on the signal. The output is different because the internal states of src have changed. Use reset to reset the converter and call the converter again. Verify that the output is unchanged. Create a multistage sample rate converter with default properties, corresponding to the combined three filter stages used to convert from 192 kHz to 44.1 kHz. Compute and display the frequency response. Compute and display the frequency response over the range between 20 Hz and 44.1 kHz. Create src, a multistage sample rate converter with default properties. 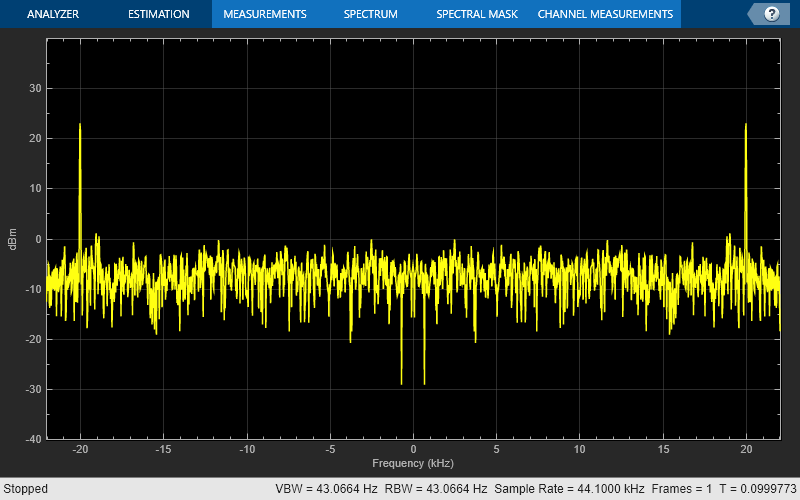 src converts between 192 kHz and 44.1 kHz. Find the individual filters that are cascaded together to perform the conversion. Visualize the frequency response of the decimator used in the first stage of the process. Create a multistage sample rate converter with default properties, corresponding to the combined three filter stages used to convert from 192 kHz to 44.1 kHz. Display information about the design. Get the actual output sample rate for conversion between 192 kHz and 44.1 kHz when given a tolerance of 1%. Create src, a multistage sample rate converter with default properties. src combines three filter stages to convert from 192 kHz to 44.1 kHz. Determine its overall interpolation and decimation factors. Create a multistage sample rate converter with default properties, corresponding to the combined three filter stages used to convert from 192 kHz to 44.1 kHz. Visualize the stages. The general multistage sample rate converter performs a multistage decimation, a single-stage sample rate conversion, and a multistage interpolation, in that order. Actual designs include at most two of those steps. The procedure determines automatically the optimal number of decimation or interpolation stages. In special cases, the decimation or the interpolation can be performed in a single stage. The algorithm always attempts to start by reducing the sample rate. This decreases the amount of computation required. The decimation step is designed so that no intermediate sample rate goes below the bandwidth of interest. This ensures that no information is filtered out. Each individual stage uses halfband or Nyquist filters to minimize the number of nonzero coefficients. Transition-band aliasing is allowed because it decreases the implementation cost. 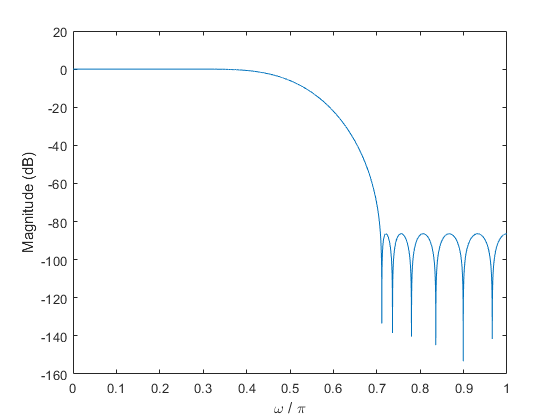 The signal within the bandwidth of interest is kept alias free up to the value specified by the StopbandAttenuation property.